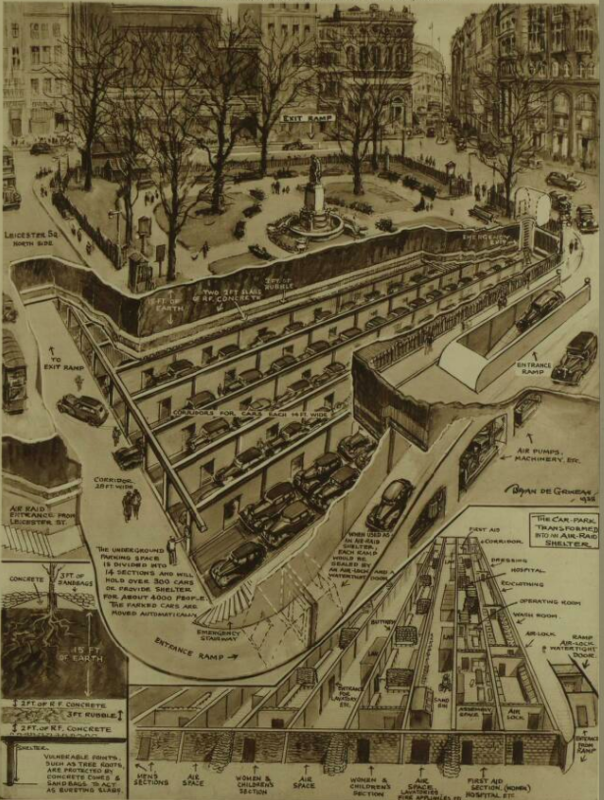 Leicester Square as a place to park your car, or shelter from bombs. This striking cutaway image from 1938 shows unrealised plans for Leicester Square. The heart of the West End was considered for the site of a huge subterranean car park. This being 1938, the prospect of war was never far away. The plans by Sydney Clough (drawn by Bryan de Grineau) were conceived with aerial bombardment in mind. In times of conflict, the car park would double as an air raid shelter. 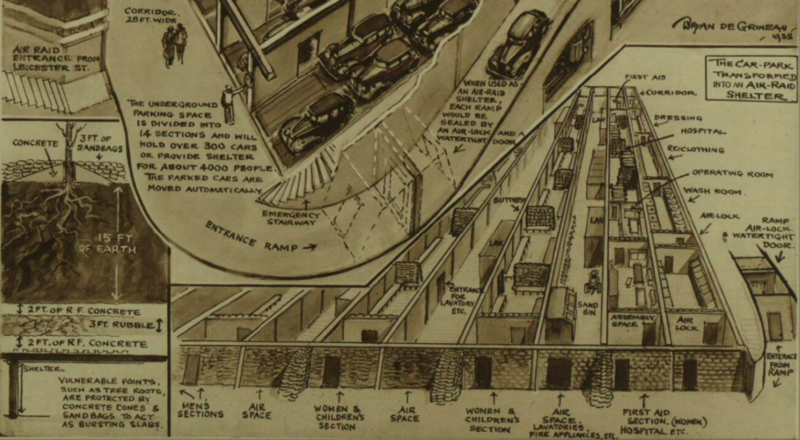 The subterranean car park was designed for 300 cars, and was unusual in other ways. Vehicles would have been parked nose to tail. To get one out, the surrounding cars must be shuffled about mechanically, like a giant sliding puzzle. As an air-raid shelter, it could have accommodated up to 4,000 people, complete with lavatories, wash rooms and hospital facilities. Similar plans were proposed for Russell Square. Neither was ever implemented, though car parks were eventually constructed (post-war) beneath others squares, including Bloomsbury Square, Cavendish Square and Finsbury Square. Leicester Square is thankfully pedestrianised. It was finally excavated in the 1980s to build an electrical substation. Image from the Illustrated London News, 31 December 1938. (c) Illustrated London News Group. Found in the British Newspaper Archive.